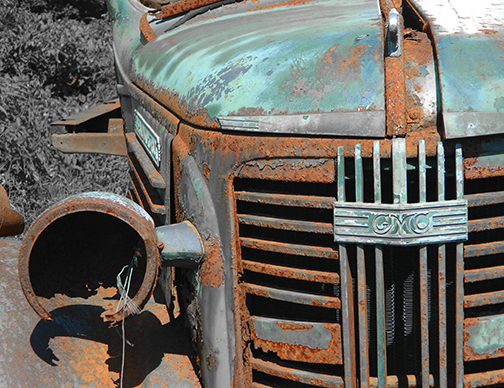 "Rusted Relics" is a two-artist exhibition of color photographs by Lisa Berger of Newtown and Tara Tomaselli of Bethel. Berger and Tomaselli both have bodies of work that show that rust is more than just a process that changes iron into iron oxide with oxygen and moisture. The images in the exhibition reflect close observation of surfaces and textures that draw the viewer into worlds hidden in plain sight. Details become studies in composition or abstract landscapes. The curves of massive gears intersecting, or of rail plates stacked on top of each other, prove that there is beauty found everywhere as nature reclaims even steel. The photographs in the exhibition were printed by Still River Editions. I believe art should evoke some emotion or curiosity that leads to a deeper conversation. Early in my art journey, I was drawn to working in realism; landscape, still life and portraiture. A few years ago, I began to experiment with abstract images. For me, the abstraction in photography often occurs by capturing just a portion of a specific scene or object, isolating it from its normal contextual environment. By focusing in on something and playing with depth of field, I can highlight those aspects of a subject that I find compelling. Whether it be rich color, shape, form or texture, I seek to create a unique perception of familiar objects. And ultimately capture the viewer’s imagination. The images that I have selected for this show capture the impact that Mother Nature has had on metal objects and the beauty that often comes from that interaction. I‘m drawn to the rich color, texture, and intricate patterns particularly in rusted metals, peeling paint, and the juxtaposition of new and old. Whether it be a close up of a rusted file cabinet laid to rest behind an abandoned red bricked mental institution, cast away rail plates in an old train yard, or the brilliant patina on the side panel of a pick-up truck, I am intrigued by the fine detail and abstract quality of the composition. As I continue to explore the world around me, I often see “abstract images” in common everyday objects. Finding beauty that others may rarely notice. I feel that if we are willing to open our minds and pay attention, art is really all around us. Lisa Berger is an award-winning artist working in photography, abstract painting, mono printing, and eco printing. She holds a B.A. in Art Education from Westminster College in New Wilmington, PA. While in college she worked for a local design agency and taught private art lessons to children in the community. After graduation, Berger joined GE Capital in Marketing Communications and Public Relations. Following her corporate career, Lisa became active volunteering in her community while raising two sons never losing sight of her love of art. Berger began showing her art throughout Connecticut and the region in 2016. Her work has been recognized in numerous juried shows hosted by the Mystic Museum of Art, Kent Art Association, Rowayton Arts Council, Wilton Arts Council and the Stamford Art Association and is also in several private collections throughout New England. One her mixed-media pieces will be included in the Silvermine Art Center's Paper Show from April 3 through May 16, 2019. Lisa Berger currently lives in Newtown, CT with her husband Paul. This collection of images depicts mechanical and transportation-related objects after their transformation over time. The items that draw me in are the ones that existed before my time, with signs of age and deterioration. Much like we as humans undergo this physical transformation, so do these objects. I want to show the beauty in things regardless of their current state. My works capture the rusted relics of bygone eras and the various ways these objects are honored by their owners. While they may no longer be shiny and new, there’s a different kind of beauty in their present state. One just has to look deeper to appreciate it. By photographing these objects close up, I draw the viewer’s attention to the simple shapes, lines and patterns represented in common objects forgotten or abandoned. I explore various compositions, looking at something from different points of view, different perspectives, understanding it and presenting it. And just like we all have our individual stories to tell, so do these objects. Each object has its own history. Viewers are invited to imagine and make their own personal connections to the objects – uniting past with present. Tara Tomaselli is a fine art photographer and artist, professionally exhibiting and selling her digital photographs since 2012. She holds an M.S. in Studio Art and a Certificate in Art Museum Education from the College of New Rochelle. She received her B.S. in Art Education from Skidmore College and has permanent NY State Teaching Certification in Art. As an art educator, Tomaselli has extensive experience developing and implementing K-12 art programs in schools, museums, and other non-profit organizations. The Gallery at Still River Editions has hosted national and regional photographers and artists since 1989. In spring 2011, after a brief hiatus from exhibiting new work, the gallery returned to hosting shows on a quarterly basis. The Gallery's mission is to show traditional and digital prints of photographs and fine artwork, and to be a center of creativity and connection in the Danbury area. The Gallery at Still River Editions is open during normal business hours 8:30 am - 5 pm Monday through Friday, and during posted hours for special events. The Gallery does not accept unsolicited submissions at this time. WE SUPPORT THE AMERICANS WITH DISABILITIES ACT. WE ARE WHEELCHAIR ACCESSIBLE IN OUR GALLERY AND LOBBY.